It is always such a treat to visit our family for many reasons. One of which is the creative ideas that come out of DIL Kristen’s kitchen. Michael and Kristen feed their children well. They are trying to keep their diets as natural as possible. Roasted root vegetables, fresh fruit, avocados, and quinoa are a part of their daily meals. They eat meat, poultry and fish, but many of their dinners are vegetarian. A new ingredient that Kristen has been experimenting with lately is Chia Seeds. I know what you are thinking. . . . . Am I going to grow grass all over my body if I eat chia seeds? The answer is no. Unlike the ubiquitous Chia pets from a few years back, chia seeds are now being offered as a wholesome alternative to flax seeds in our diets. Grown in Mexico and Bolivia, they are rich in omega-3 fatty acids, antioxidents, protein and fiber. They offer a bit of crunch to breads and doughs while boosting the nutrient value. 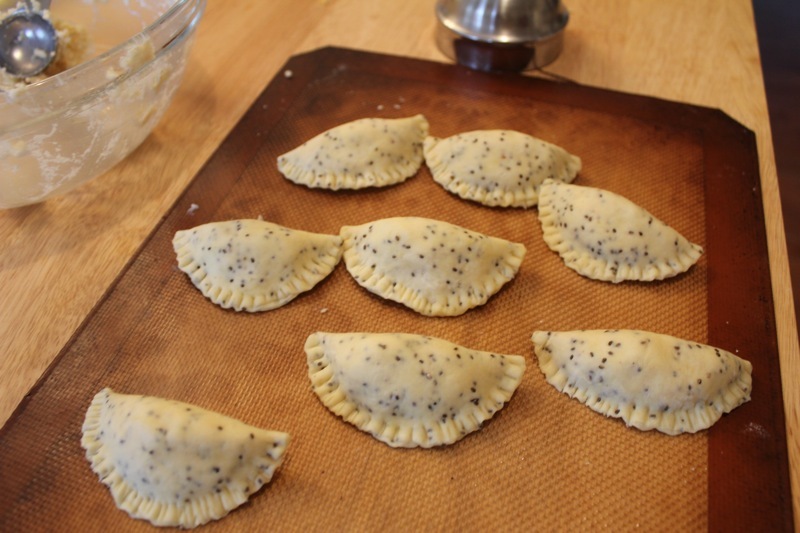 Kristen decided to make a Southwestern flavored dish with homemade pierogi and chia seed dough. 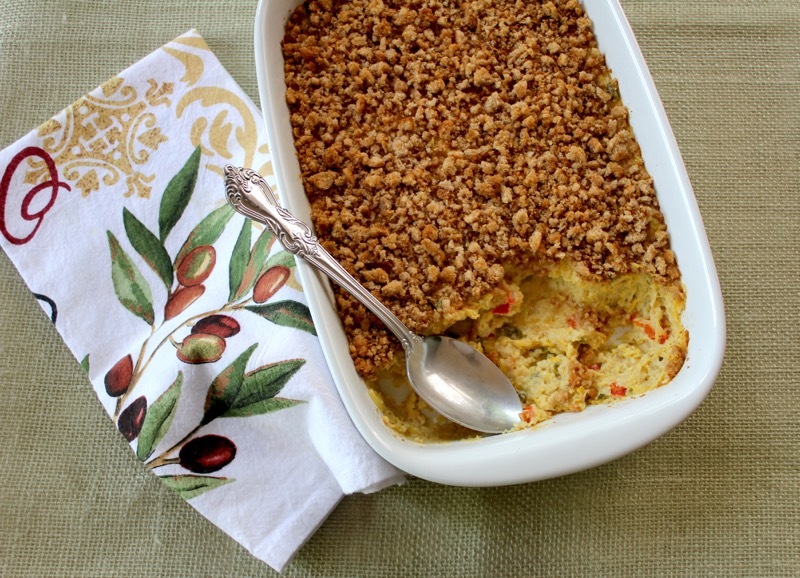 The filling was mashed potatoes with green chiles, sour cream, cheese, and cumin. 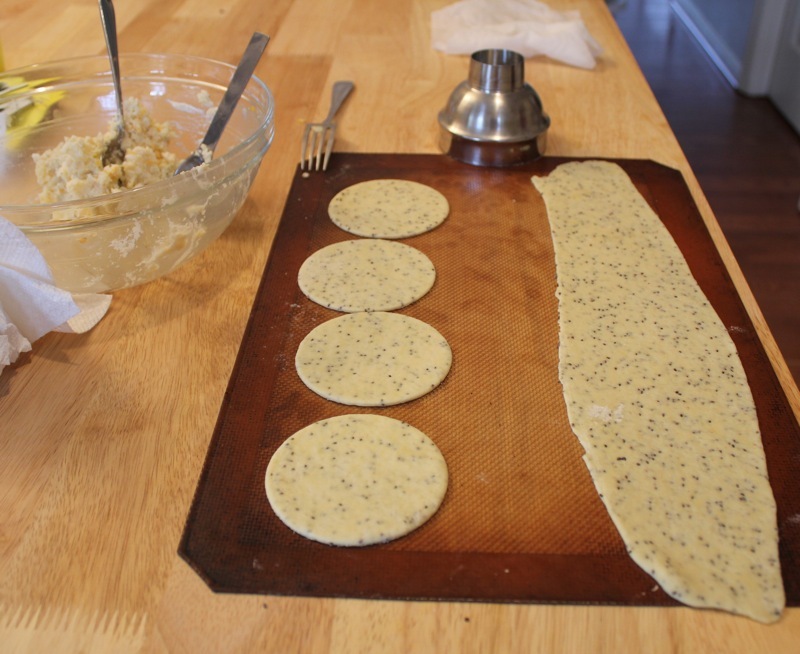 The dough was flecked with the chia seeds. Kristen used her pasta attachment to her Kitchen Aid mixer to roll the dough. But you could also do it by hand if you don’t have a pasta machine. Circles were cut from the dough. A tablespoon of the potato mixture was placed in each circle of dough. The opposite sides of the dough were brought together and the edges were pinched shut. The edges were further sealed with the tines of a fork. 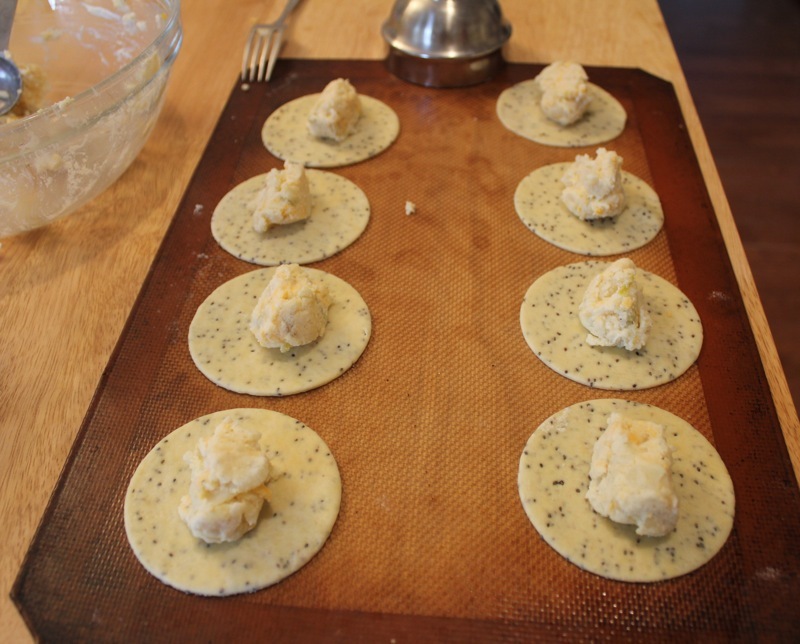 It is a good idea to keep the pierogi covered with damp paper towels as you work so that they do not dry out. Another dish that Kristen made that continued the Southwestern theme was roasted Chayote squash. 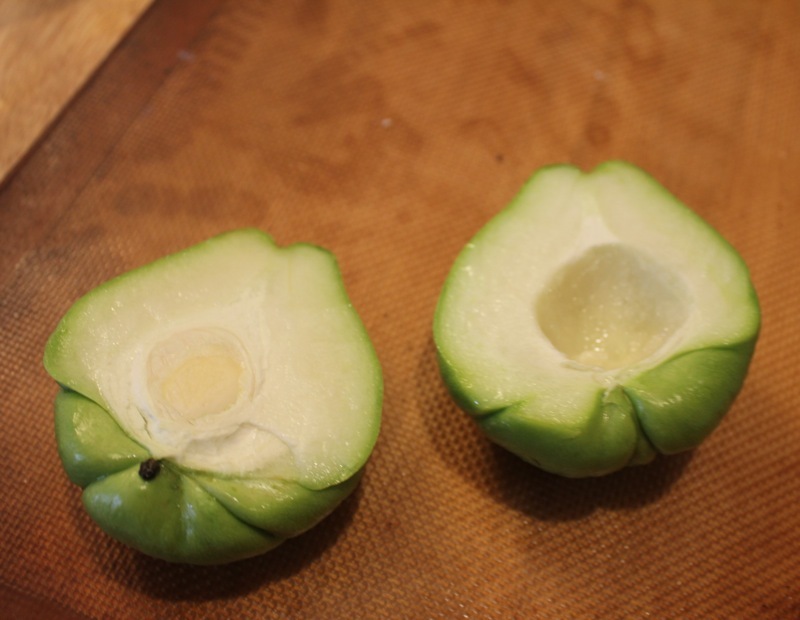 Native to Mexico, Chayote squash is similar to summer squashes like yellow squash and zucchini. She roasted it with onions and seasoned it with salt and pepper and a hit of coriander. Everyone loved this meal. 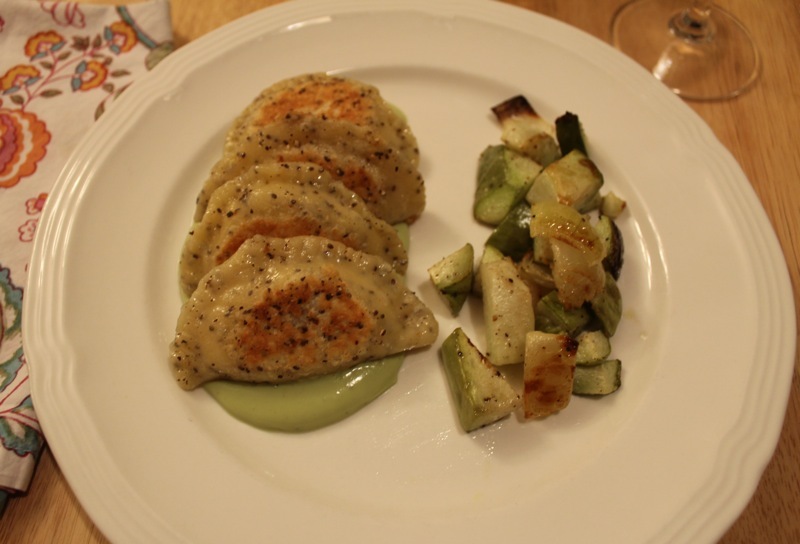 The pierogi were flavorful and the avocado cream sauce was light and velvety with a bit of tang from the sour cream and lime. 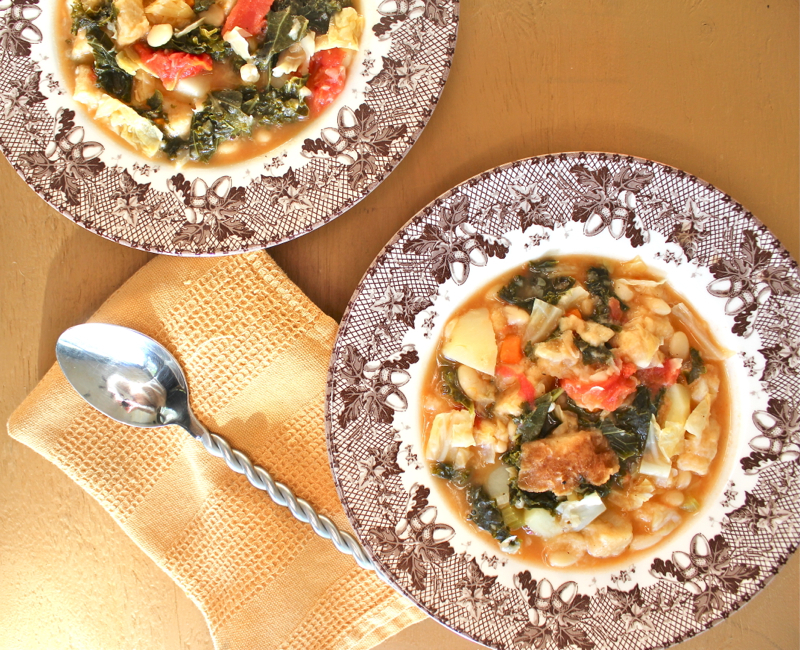 This is one of those meals that is somewhat time consuming, But the fact that all of the components are homemade, flavorful and nutritious makes it all worthwhile. On a lazy Sunday afternoon I may even make a batch of pierogi and freeze them for several meals. Mix together the flour and salt. Add the egg to the flour and combine. The dough will be quite clumpy at this stage. Using just your fingertips, knead and fold the dough, picking up bits around the bowl until the dough becomes less sticky but still quite moist. It will be a firm dough. Wrap the dough well in plastic wrap and refrigerate for 1-2 hours, or up to 48 hours. I found that the longer the dough chills, the easier it is to work with. My brother tells me that chilling dough helps the gluten to relax? Whatever that means. Peel and cut potato into large pieces (6 to 8 pieces per potato). Boil in 1.5 cups of chicken broth until tender. Drain and rinse potatoes in cold water. Blot with a clean dish towel or layered paper towels to remove excess moisture. Gently mash the potato until there are only small chunks (or no chunks if you prefer) remaining. Stir in cheese, sour cream, green chiles, and cumin. Taste and adjust the seasonings with salt and pepper. I cut the dough in to 8 sections, shaped and rolled gently into a small rectangle. Then, I worked one section at a time through my pasta roller attachment. 4 passes at setting 1 (the thickest setting), 4 passes through setting 2. If you are hand rolling, I still think it’s easier to cut the dough in to 8 sections and the roll each section out into a long rectangle or oval. It should be roughly about 1/8” thick. You can either roll out all the dough, then cut and fill – or you can roll a couple of batches, cut and fill those, then repeat with remaining dough until complete. It probably depends mostly on the size and work surfaces available in your kitchen. Ours is small! TIP: Any dough you are not actively working with should be loosely wrapped in plastic wrap or covered with a damp paper towel or cloth at all times. Use a 3-4” round cutter to cut circles of dough (I used the top of our cocktail shaker). 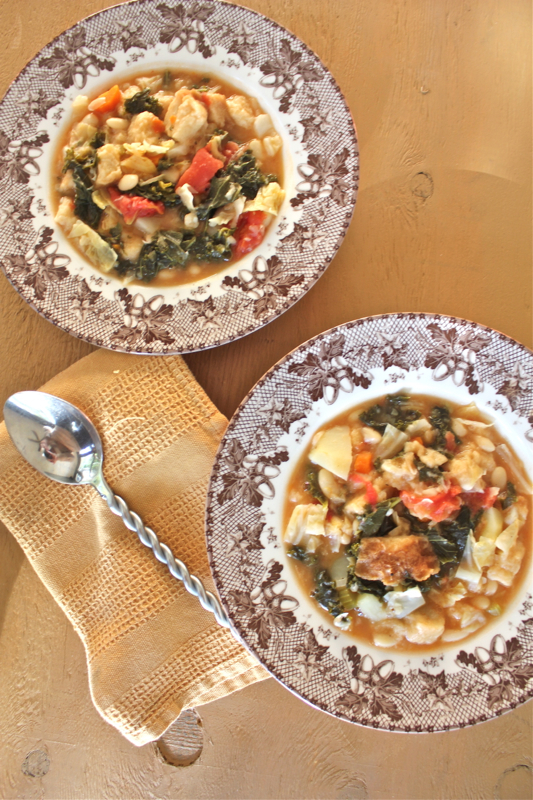 Repurpose scraps by creating another section of dough or snip into small pieces for soup noodles. Place 1 tablespoon of filling on each round of dough. Gently pull two opposite sides of the dough up together and press together working from the center out to ther corners to form a pocket. Pinch the edges of the pierogi to seal, then seal again with the tines of a fork. Cook in a large stockpot of boiling unsalted water (since I added salt to my dough, it was not necessary to salt the water). 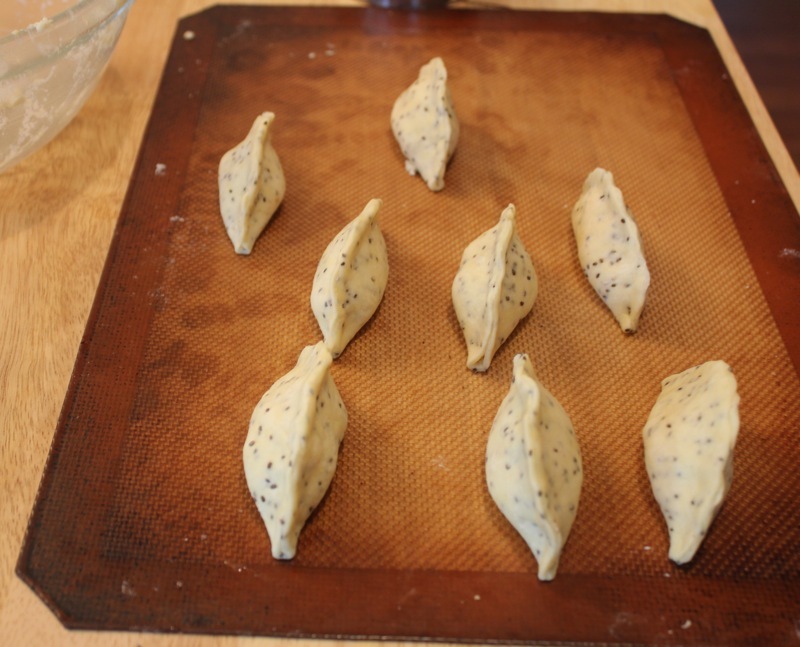 Only cook about 10 pierogi at a time, so that they have room to float without sticking. When the pierogi float after about 5-6 minutes, they’re ready. Fish out of the water with a slotted spoon and set aside on a plate until all the pierogi are boiled. on medium low and add enough olive oil to generously coat the pan. one at a time, add the pierogi to the skillet and gently swirl (by hand) in the olive oil to prevent sticking. Fill the pan with perogi, but don’t over-crowd. 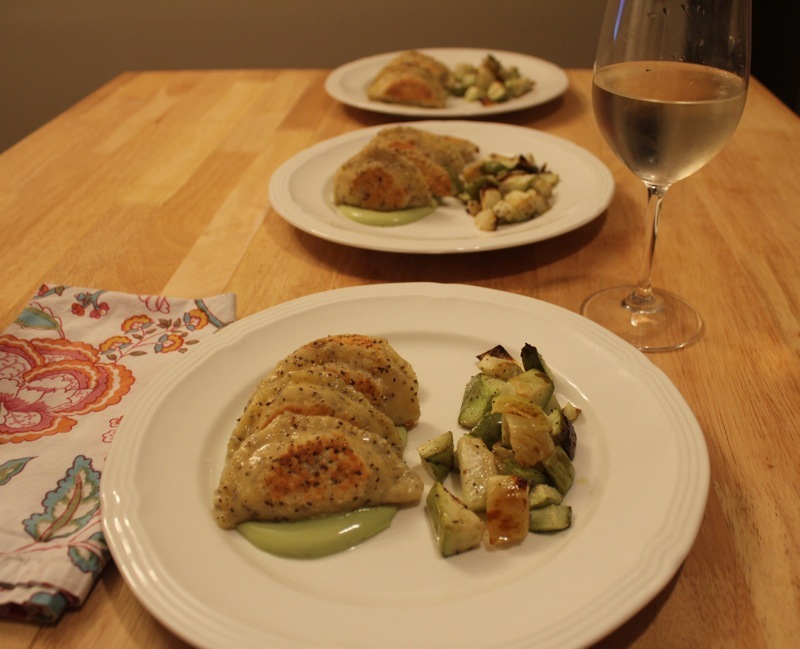 If your pan is too hot, the pierogi are more likely to stick so watch the heat! 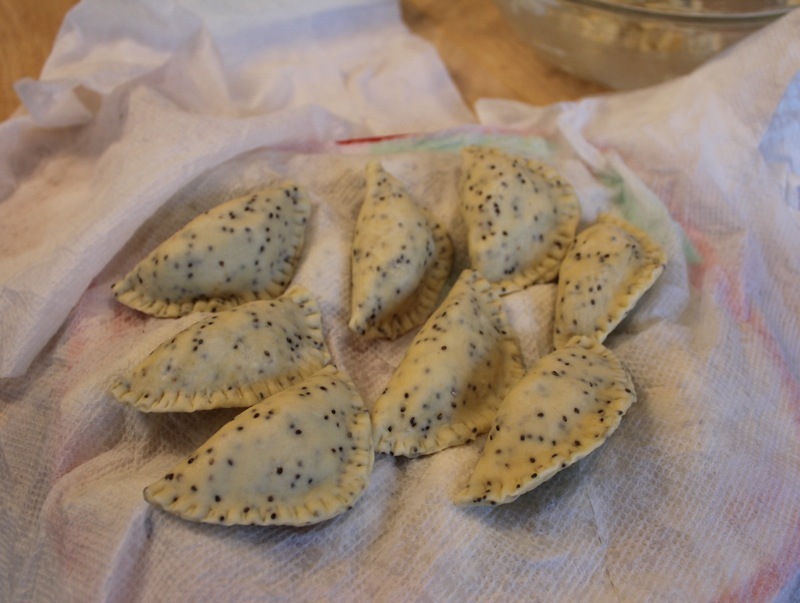 Sprinkle lightly with salt and pepper on the sides that have not yet been introduced to the oil. Flip with tongs once the down side is lightly browned and crispy. Crisp up the other side and remove from pan (cook in batches and keep completed pierogi warm in a 200 degree oven while the others cook) . Using an immersion blender, blender or food processor, puree all sauce ingredients until a smooth, thick pourable consisentcy is achieved. Spread 2-3 spoonfulls of sauce on a plate and place 4-5 pierogie (sitting up) on top. Serve your favorite seasonal roasted vegetable alongside. Posted on April 1, 2013 at 1:23 pm. There is a 3 Star Michelin rated restaurant in Paris that I have no intention of visiting. It is not that I wouldn’t enjoy eating there. I’m sure that I would. But it would be hard for me to spend 360 euros per person for a meal. The restaurant is L’Arpege and the chef is Alain Passard. Alain Passard has come to be known as the vegetable magician. In 2001 he removed red meat from his menu and put an emphasis on vegetables instead. But these are not just any vegetables. He maintains a large biodynamic vegetable farm in the Sarthe area of France, 200 kilometers Southwest of Paris. The fields are plowed by mules and there is not a pesticide or machine in sight. Each day’s pick goes out to Paris by TGV fast train. Within an hour it is in the L’Arpege kitchen where the magic begins. 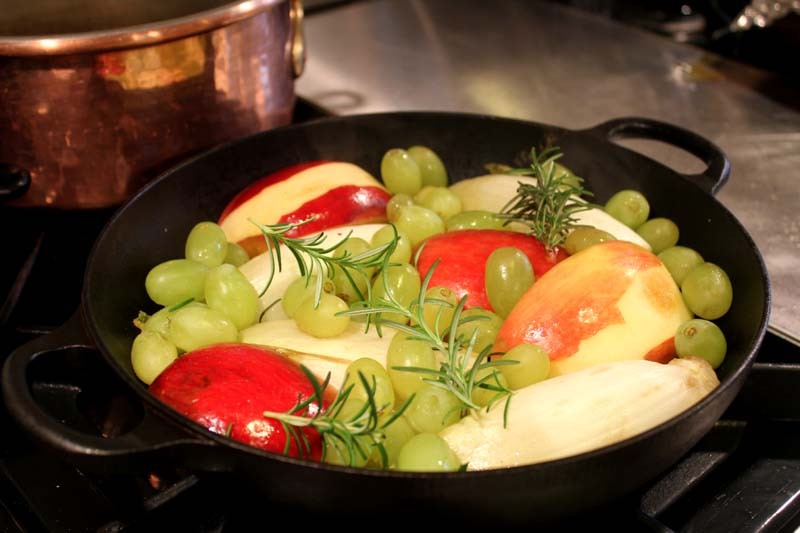 This recipe for endives, apples and grapes is one of Alain Passard’s creations. It is in Dorrie Greenspan’s cookbook, Around my French Table. 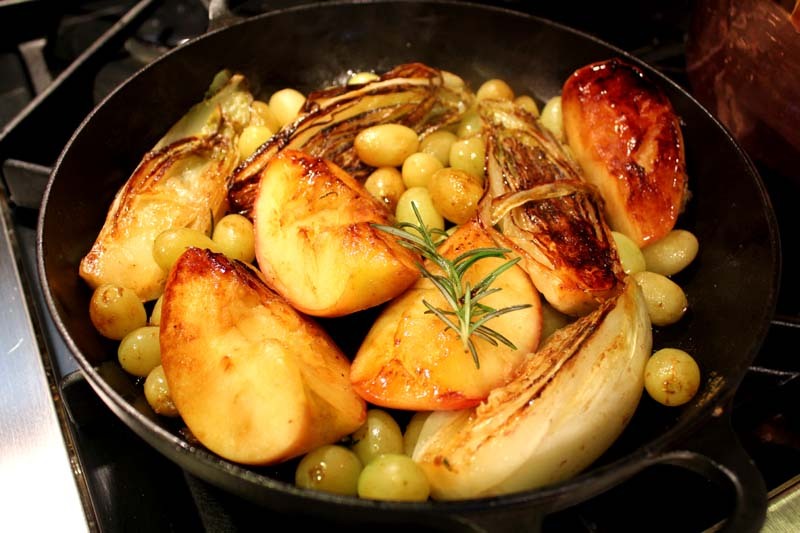 I have always loved braised endive but it had never occurred to me to braise grapes. I will never look at grapes the same way again. They are wonderfully sweet when cooked. This dish combines the slightly bitter taste of the endive with the natural sweetness of the apple and grapes to make a memorable side dish. It paired nicely with the pork ribs that we grilled. I don’t need to spend a fortune at a 3 star restaurant when I can enjoy a meal like this at home. But still, I might just walk by L’Arpege when we are in Paris and admire it from afar. Put a large skillet over low heat and toss in the butter. When it’s melted, put the endive into the pan cut side down and the apples skin side up. 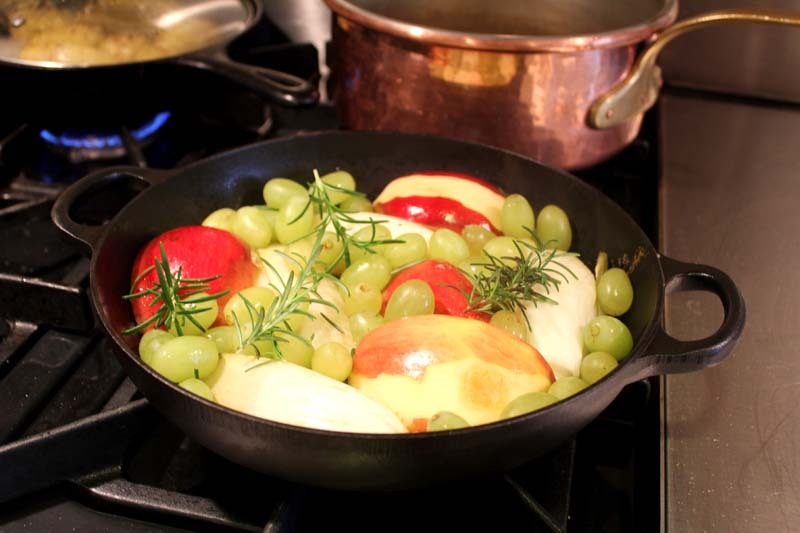 Add the grapes, scatter over the rosemary, and cook, undisturbed, for 20 minutes, at which point the underside of the endives will have caramelized and the apples and grapes will be soft and perhaps browned. Gently turn everything over, baste with any liquid in the pan, and cook for 20 minutes more. Transfer the ingredients to a warm serving platter or to individual plates and using a sturdy wooden or silicone spoon, scrape up the cooking sugars sticking to the bottom of the pan. You might want to pour a few spoonfuls of water into the pan to help you nab the sugars and make a spare amount of sauce. Season the endive with salt and pepper, spoon over the jus, and serve. Serves 2 to 4. Posted on May 19, 2012 at 6:20 am. 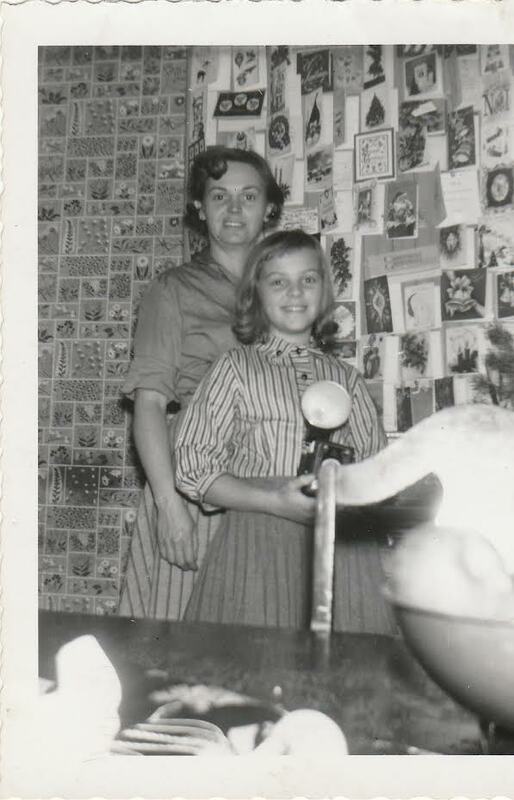 It has been a long time since I’ve blogged about any of Ina Garten’s recipes. 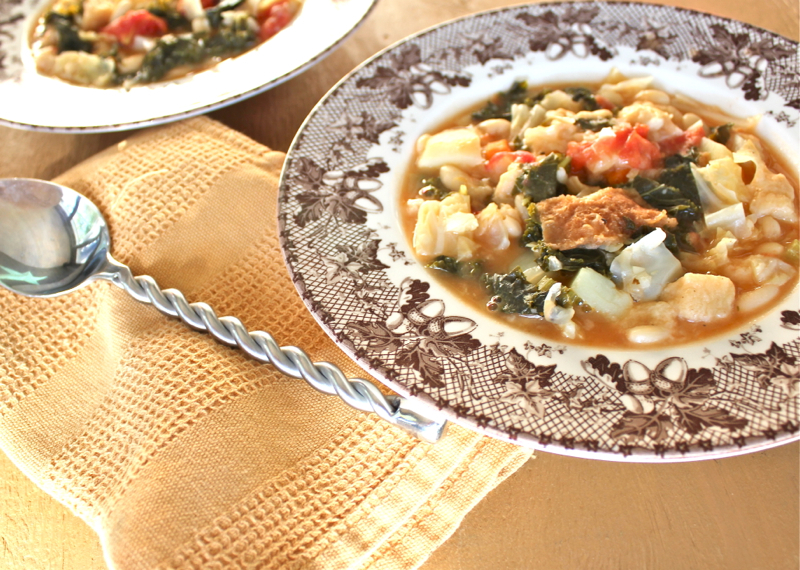 I used to belong to a group called the Barefoot Bloggers and we all chose particular recipes from The Barefoot Contessa and blogged about them twice a month. The group has disbanded, but I still like to rely on her recipes from time to time. One of her cookbooks that I never purchased was Barefoot in Paris. Can you believe it? I checked it out of the library last week. Saturday night dinner is usually special in our house. I was in the mood to cook again and wanted to try something new. 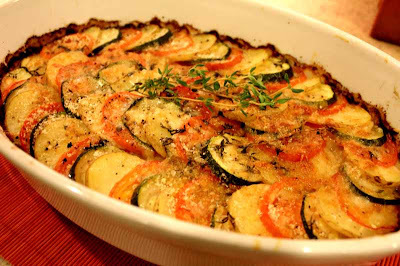 This vegetable tian is so pretty. It is easy to assemble and cooks simply in the oven. The only thing you need to be aware of is choosing vegetables that have the same diameter. The zucchini, potatoes and tomatoes should be about the same size. Also I am looking for recipes that can be made ahead of time. Bike week in Daytona is coming up in March and our biker friends will be here for the event. I always like to have a few dishes stashed in the refrigerator to be easily rewarmed and served. This tian fits that category beautifully. Brush a 9x13x 2-inch baking dish with olive oil. In a medium saute pan, heat 2 tablespoons of olive oil and cook the onions over medium-low heat for 8 to 10 minutes, until translucent. Add the garlic and cook for another minute. Spread the onion mixture on the bottom of the baking dish. 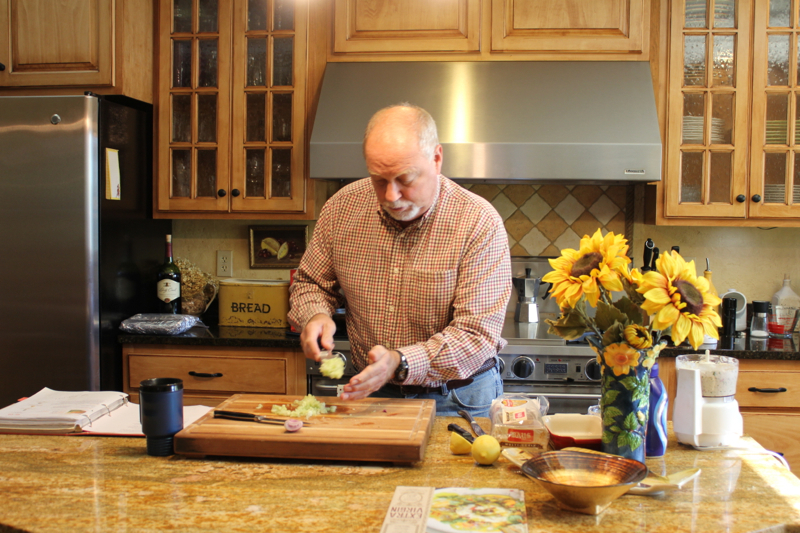 Slice the potatoes, zucchini, and tomatoes in 1/4-inch-thick slices. Layer them alternately in the dish on top of the onions, fitting them tightly, making only one layer. Sprinkle with salt, pepper thyme leaves, and thyme sprigs and drizzle with 1 more tablespoon of olive oil. Cover the dish with aluminum foil and bake for 35 to 40 minutes, until the potatoes are tender. 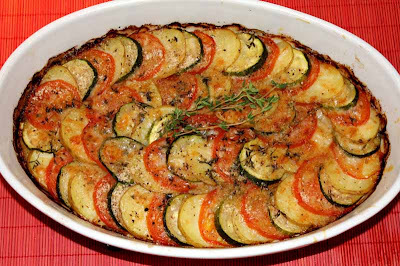 Uncover the dish, remove the thyme sprigs, sprinkle with cheese on top, and bake for another 30 minutes, or until browned. Serve warm. 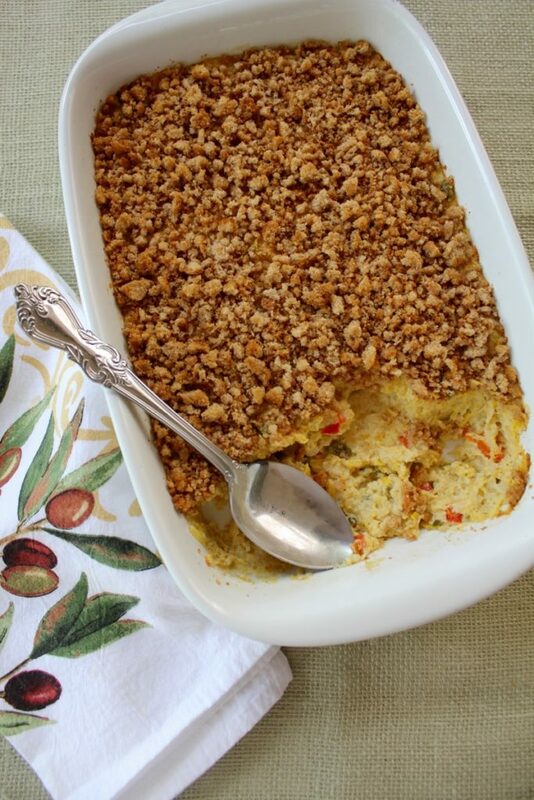 Can be made ahead of time, refrigerated and reheated at serving time. Posted on February 26, 2012 at 12:00 pm.